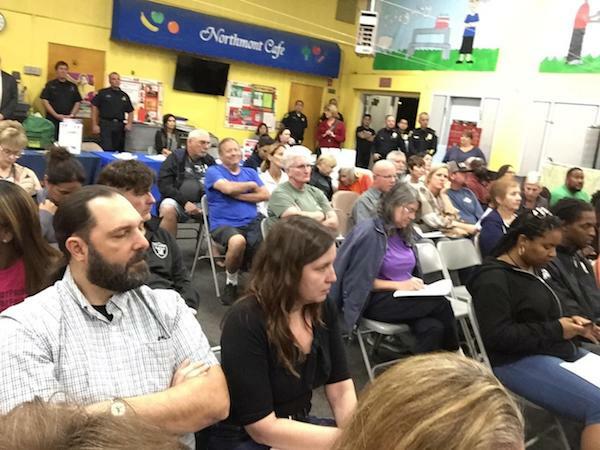 “This is what democracy looks like!” was an often-reiterated theme of the many citizens who came out to this year’s annual La Mesa town hall meetings. The town hall meetings — the first on Jan. 30 at La Mesa Arts Academy and another on Feb. 6 at Northmont Elementary — were dominated by students, activists and residents demanding answers and action over a Jan. 19 incident at Helix Charter High School, where a La Mesa police officer was filmed slamming a handcuffed student to the ground following a disciplinary suspension from school. Explaining that state laws restrict them from speaking about the incident itself, City Council, city staff and Police Chief Walt Vasquez instead fielded questions on the investigation into the incident, as well as police procedures, hiring practices and training. Many of the speakers demanded the department suspend or fire the officer involved in the incident and several students got into heated exchanges with council members. 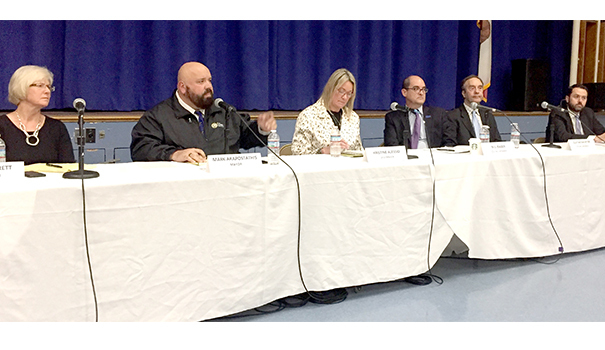 In addition to those who came to speak about the student-police altercation at Helix, the town halls also brought other La Mesa residents who voiced concerns over a myriad of issues, some dealing with city infrastructure. A man named Joe asked about the scope of the University Avenue median project, which has been cut in half, he said. City Manager Yvonne Garrett said the completed medians were paid for with a grant from the Water Resources Control Board, and that revitalizing the University Avenue corridor is still a goal of the city. Garrett said there is currently a project underway to improve bike lanes and sidewalks along University. “We feel that as we make those improvements to the sidewalk and bicycle lanes, we’re going to improve the rest of it,” Mayor Mark Arapostathis added. Assistant City Manager Greg Humora said repaving should be done by the end of the year. Resident Kathleen Brand raised the issue of crosswalks and the need for infrastructure in a rapidly growing La Mesa. She pointed to the Quarry residential development, which city staff allowed a reduction in parking due to its proximity to the trolley station. Brand suggested the city add more crosswalks along La Mesa Boulevard before the recently-approved Little Flower Haven project is built, because the limited parking at that development will have people parking around the neighborhood and walking to get there. Several residents raised issues involving traffic and parking in their neighborhoods. A resident who lives on Pomona Avenue said that after he complained about speeding last year, for a while things were better when there were stepped-up patrols, a trailer with a speed indicator, and officers ticketing drivers near Stanford and Pomona avenues. City Councilmember Bill Baber added that an improving economy also puts more cars on the road. A man named Edward brought up the long pauses the trolleys take near Severin Drive and how that causes unnecessary waiting at the light. City Councilmember Guy McWhirter explained that the pauses are guided by federal government regulations due to the trolley tracks’ proximity to sidewalks. A Yorkshire Avenue resident named Dave took issue with the traffic lights in his neighborhood. Resident Lee Sandvick offered an idea to ease parking and traffic in and around the Village by proposing electronic trams, like the kind that are found in Downtown San Diego, which would cart residents and visitors to and from the Village from homes and parking lots. “It’s a win-win for visitors and residents alike,” she said. Mayor Arapostathis said that cost would be a concern in starting such a program. Another woman commented that there would be more parking in neighborhoods if residents used their garages and driveways for parking cars, rather than storage. A resident named Kevin complained about parking tickets he received because of street sweeping along Nancy Drive, where he lives. “If you don’t move your vehicle on the third Tuesday of the month, you will get a nice $42 ticket. I have four,” he said, adding that the tickets themselves are less of an issue than the city’s uneven rules on street-sweeping tickets. Janfred Way, Poppy Street, Water Street and Wolf Court have streets swept, but because there are no signs put up, there are no tickets given and the street sweeper drives around the cars, he said. “You’re absolutely right, it needs to be consistent,” replied Arapostathis. Angela, a resident on Sisson Street, complained about the city’s lack of enforcement on trailers and motorhomes parked on streets. Culbertson Avenue resident Donna Marie Tol said she has noticed an increase in the area’s homeless population. Councilmember Colin Parent acknowledged homelessness as a “real and growing issue” in the city. He said La Mesa recently joined the Regional Continuum of Care, Regional Task Force for Homeless after a county grand jury faulted the city for not being part of it. Parent said the city is also taking steps to address housing affordability and pointed to a recently-adopted affordable homes bonus program, which gives incentives to developers that build subsidized affordable units. The city also formed a subcommittee to look at other affordable housing options in La Mesa, including easing restrictions on homeowners building “granny-flat” rentals on their properties. Councilmember McWhirter added that regional programs, like East County Transitional Living in El Cajon, will be where most of the help comes from. “I know the county, that has the money for a lot of this, needs to step up,” he said. Resident Carol Biederman suggested offering more public toilets to combat potential health risks caused by homelessness, such as the recent outbreak of hepatitis A. She also suggested that the city build a homeless shelter. “I think it would be suitable for us to think about having some kind of place where people can get in out of the rain and off the streets,” she said. A group of residents raised concerns about a recent transitional home for drug rehabilitation patients that recently opened on Joel Lane. “We have had this facility operating for about a month and it is causing a considerable amount of stress to a lot of the residents,” said a woman named Ellen, who added that parking, traffic, smoking, noise, lack of privacy, change to the overall feel of neighborhood, property values and worries about potential criminal activity are the biggest concerns of the neighborhood. She wondered how a drug rehabilitation home could open on a cul de sac. City Attorney Glen Sabine said that if the facility has six or fewer residents, then there is nothing the city could do under current law. “Some of the unlicensed homes, or if there are more than six [occupants], then we have some use-permit controls that would apply, but then we’d have to find out if that is in fact the case,” he said. Councilmember Kristine Alessio said this is an issue that she has been working on with state representatives to change or amend laws, to give cities more flexibility in the locations these businesses can operate. Alessio also offered to help mediate with the owner and neighborhood to address problems stemming from the rehabilitation home. Marie, who lives near Helix High School, said that noise from airplanes has suddenly become an issue in her neighborhood. Arapostathis said that three years ago, the city was notified by the FAA of a change to flight paths around San Diego. “They now use GPS so instead of the planes flying south over [state Route] 94, they are flying in a more tight pattern. They notified us after the decision was made,” he said. The city of La Mesa doesn’t lobby the federal government, but was one of 18 cities who went to the county’s Airport Authority and lodged complaints and started contacting senators and members of Congress. “I send a monthly letter and I make the phone calls to the Airport Authority,” Arapostathis said, adding that he learned the Airport Authority doesn’t like the decision either. Marie mentioned that some cities are suing FAA and asked if La Mesa had plans to do the same. City Manager Garrett said the city could consider that, but in the meantime, he said there is a local FAA advisory council with local representatives, which meets regularly, and that would be a good place to start advocating. A woman who lives on Texas Street said a neighbor in a rental is growing pot in his yard. City Attorney Sabine said the city cannot prohibit cultivating six indoor plants, but her neighbor is probably violating city ordinances. “This city has taken action to prohibit the outdoor cultivation of marijuana,” he said. Other issues raised by residents included problems with coyotes, the Climate Action Plan, requests for reports on progress made by the city’s various subcommittees and the air quality in the city.